The Mizzou volleyball team was looking for momentum before heading into SEC play that starts this Friday. In the first match of the Miami Invitational they beat UNC Greensboro in 3-1 (25-23, 20-25, 25-19, 25-14). Whitney Little and Emily Thater, who had five kills on six attempts, led the offense in the first set. Mizzou grabbed the first set lead when it went up 16-15. They never lost the lead and took set one 25-23. The first ended the way it began with a kill for Thater. Little led the team with four kills, while Loxley Keala had seven assists in the first set. Set two started out with Little leading the way on both offense and defense. Within the first 12 points she had four kills which put her total for the match at that point at eight kills on 11 attempts and four blocks. UNGC then went on an 8-3 run to take control 18-15. Mizzou pulled within one at 18-17, but that would be as close as it came. UNGC took set two 25-20. After the second, Little still led the team with eight kills, while Ali Kreklow had 14 assists and Sarah Meister led the team with eight digs. UNGC went up early in set three 9-5 with help from Mizzou’s Emily Wilson who had two hitting errors early. Freshman Sydney Deeken then subbed in for senior Emily Wilson making her collegiate debut. Mizzou proceeded to go on an 8-3 run. 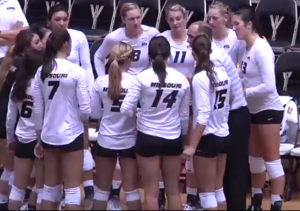 It was back and forth for the next few points until Sydney Deeken had three kills and Mizzou was up 17-14. UNCG took a timeout at 20-15 to regroup. Fllowing the timeout they pulled within three at 21-18 but would only score one more point in the third set, which ended with a Little and Loxley block. Through three sets Little still led the team with 11 kills, a .733 hitting percentage, and eight blocks. Mizzou came out hot in set four taking an early 10-5 lead. That lead would only grow from there as Mizzou was in control for the rest of the set. The match ended on a kill from Sydney Deeken, her sixth of the match, a career high. Carly Kan notched her 20th double-double which leads the SEC, and Whitney Little had her third career block-kill-double-double, and her school record seventh 10 block match. Mizzou improved to 9-4 on the season and is now on a five game winning streak. The streak will be put on the line later on Saturday night against Miami.